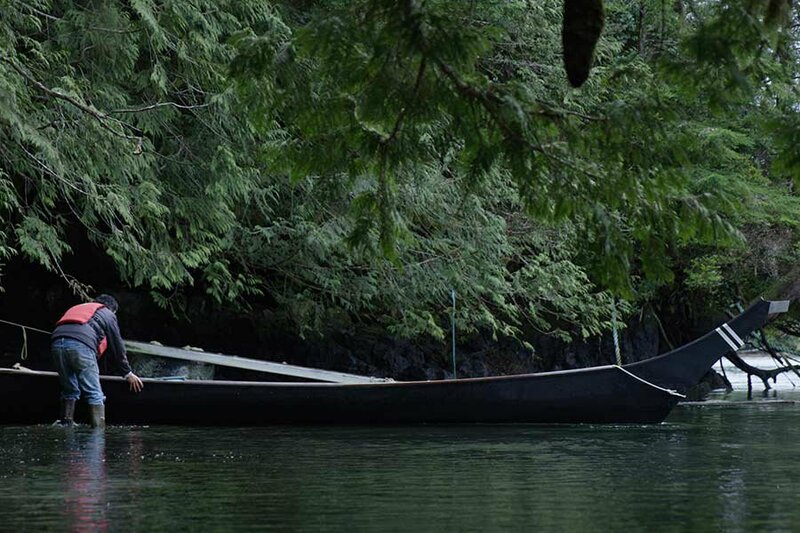 Joe Martin with one of his canoes in Clayoquot Sound. All photos by Drew Levin and Isaac Sokol / Jungles in Paris. 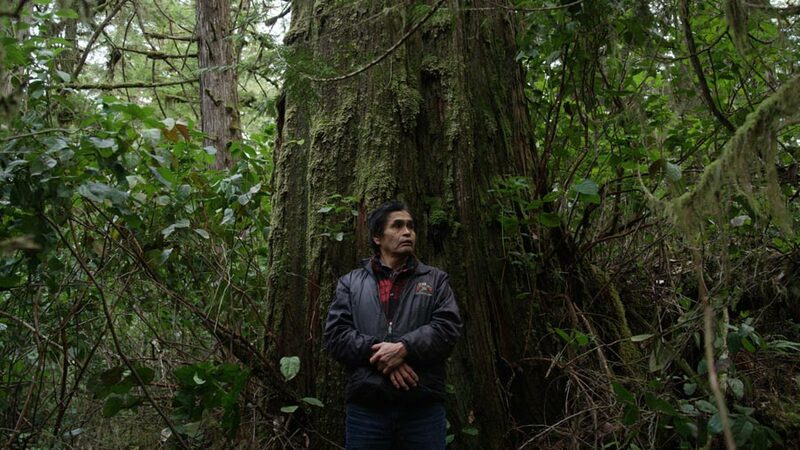 Jungles in Paris cofounder Darrell Hartman visited a beautiful, bohemian corner of Canada's Vancouver Island: Not to surf, as many visitors do, but to shoot a short documentary about indigenous canoe-making traditions, a mode of travel still relevant to the region. 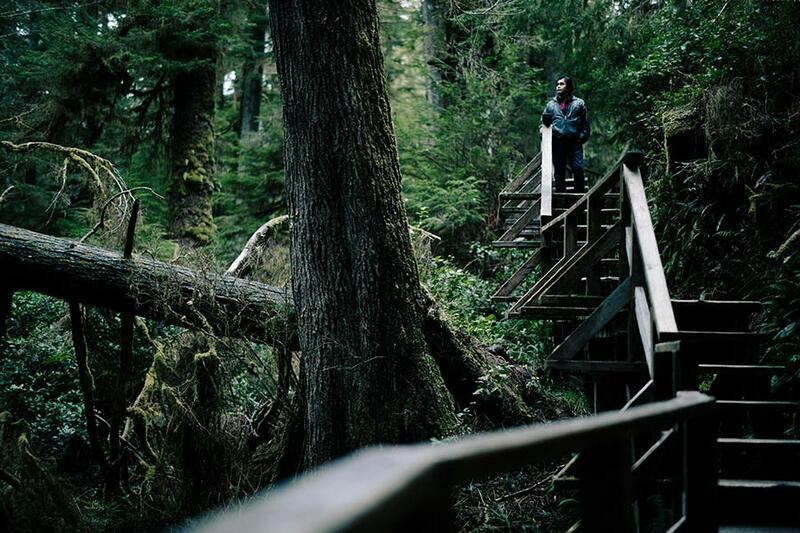 TOFINO, Canada – There's an end-of-the-earth feel to this windblown town on the west coast of Vancouver Island, a three-hour drive over mountains from the nearest ferry launch to Vancouver. 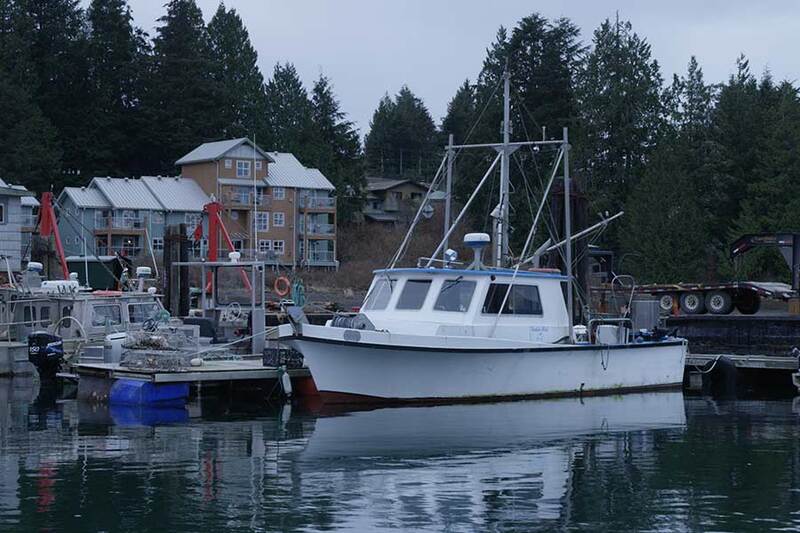 But if off-season Tofino feels remote, it's a warm and cozy form of remoteness — like kicking back in a well-heated cabin as the wintry waves crash below. Tofino has more funky Volkswagen vans per capita than anywhere I've ever been. The town owes a good deal of its bohemian personality — including eco-chic boutiques and excellent sea-and-forage restaurants — to the surf crowd that congregates here year-round. But there's more to this woodsy patch of coast than surfing. Those fiberglass boards are recent arrivals. Long before they were around, let alone cool, the only way to ride the waves was in a handsome wooden dugout canoe. The original Nuu Chah Nulth residents depended on the sea for sustenance and more, and negotiating its powerful tides was essential for survival. The "First Nations" people (the term of choice in Canada) were expert ocean navigators and canoe craftsmen. A number of them still are. And while the canoe making tradition has suffered many of the hardships known to Native culture as a whole, it remains very much alive in the workshop of Joe Martin. Now in his sixties, this lifetime Tofino resident has spent decades making the same style of dugout canoes that his ancestors did. His skills are on evidence in museums around the world. In addition to being a respected instructor and spokesperson for his craft, he's an eloquent proponent of integrating the natural world into modern life. He is, in short, a local legend. Master carver Joe Martin demonstrates Nuu Chah Nulth canoe design at his workshop in Tofino. My two-man crew — Drew and Isaac — and I spent our first morning in Tofino at Monk's Point, where Joe's workshop overlooks Clayoquot Sound. Our host threw some logs in the wood stove and got to painting the canoe he was working on. It was a smaller model, intended for a seven-year-old boy that Joe knew. That got our host talking about the first canoe he ever got — made by his father, who taught him the craft — and how it opened his senses to the marine world around him. Before he was a grown-up, he told us he "used to know where every rock was, when the tide was coming in, when I could get through certain places and when I couldn't." We said goodbye to Joe for the day around noontime, and zipped down to Pacific Rim Park to get some shots of surf crashing onto the sand. Seeking an unpopulated frame, we opted for the comparative seclusion of Florencia Bay, where timbers from an old shipwreck still litter the shore. It's a beautiful place to walk, along either the beach or rainforest paths. Had I been there as a tourist, I would have gladly done either. It was late afternoon by the time we got back to Cedar Sands, our spacious duplex rental a few miles outside of town. For dinner we drove down the main drag, Campbell Street, to a long-standing local spot called Shelter. We attacked a mound of plump Cortes Island mussels during the first course, spooning through coconut-curry broth for chunks of double-smoked bacon. My lamb sirloin was very good, and so was the pan-seared local wild salmon that Isaac ordered, which came bathed in apple-sweetened beurre blanc. 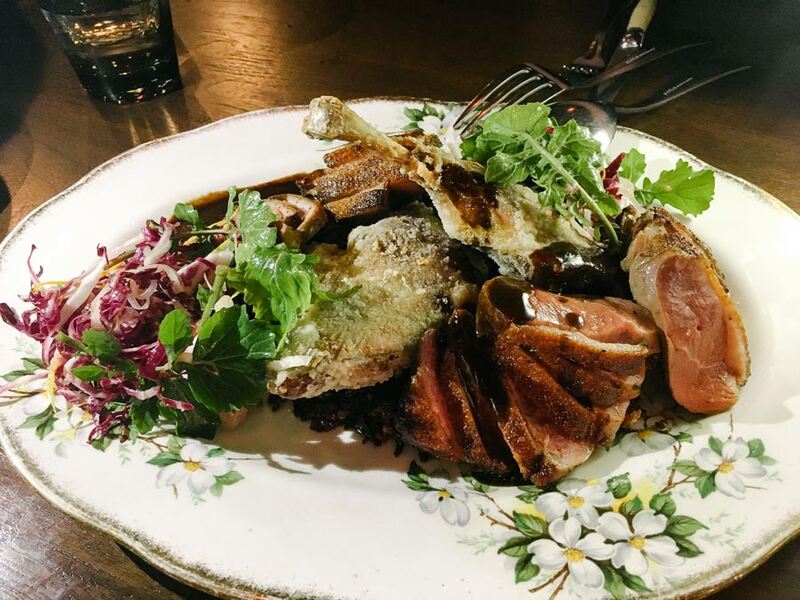 The candlelit, low-ceilinged vibe of the dining room helped the restaurant live up to its name, and the glass-walled front patio, blazing with rows of gas-powered flames, was hopping. We returned to Joe's workshop for more interviewing the next morning, fueled by caffeine and homemade donuts from Rhino Coffee House. We wanted to get on the water, too, and Joe and his daughter, Tsimka — who runs a tour company called the T'ashii Paddle School — met us later that afternoon with one of Joe's full-sized canoes in tow. As we dithered with camera gear, Joe went from relaxed to anxious: if we didn't get out there soon, he said, those tides he'd mentioned earlier would be against us. I was not one to doubt him. The five of us squeezed in, gliding through calm water and powering through the currents as bald eagles looped and the occasional motorized fishing boat whined by. Snow-capped mountains loomed in the distance. Tsimka provided a bit of the natural and cultural history she usually discusses on tours, but for much of the time we sat listening to the sounds of paddles hitting water. The crew disembarked on an island at one point to film father and daughter alone, the canoe's snout-like prow outlined against the sun. Tuna tataki at Kuma, a Japanese restaurant in Tofino that caters to the tattoos-and-beanies crowd. The dish is made with local albacore tuna, with a tamari & truffle vinaigrette. Smoked duck breast and braised duck leg from award-winning Tofino restaurant Wolf in the Fog. With quinoa, mushrooms, black garlic jus. An Moroccan-spiced octopus appetizer from Wolf in the Fog. 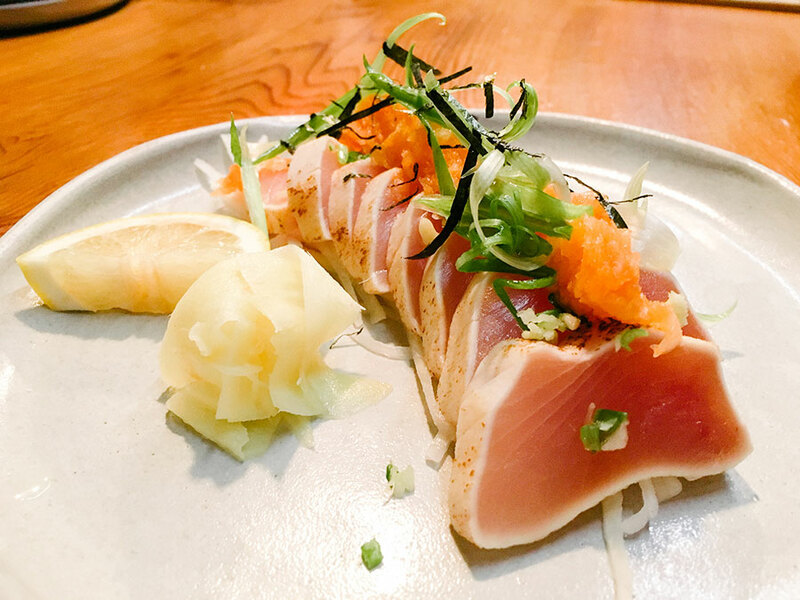 For dinner that night we sidled up to the bar — a massive plank of yellow cedar — at Kuma, a two-year-old Japanese joint run by a pair of Tofino restaurant veterans. The only way to begin, it seemed, was with hot sake. I took in the tattoos-and-beanies crowd as we waited for our food, noting that much of it seemed to be on a first-name basis with the waitstaff. My ramen bowl bristled with umami intensity: pork-crackle salt in a meaty, seaweed-y stock, with three types of seasonal mushrooms mingling with squid, anchovy, and dried flake mackerel. It was a bracing, almost overwhelmingly flavorful meeting of sea and forest. On our way out that evening we got into a conversation with a server about the chunky cardigans we'd been seeing surfers sporting around town. (Think of The Dude's look in The Big Lebowski.) Turns out they're called Cowichan sweaters, and are traditionally made on Vancouver Island. Authentic ones get snapped up very quickly. The next morning I popped into a few boutiques where we'd been told we might find the perfect new or hand-me-down Cowichan. Sadly, no such luck. But I did pick up some nice souvenirs — Tofino sea salt and a small bag of foraged salal tea, traditionally brewed by Coast Salish peoples as medicine — at Caravan Beach Shop. As a non-surfer who owns plenty of Patagonia already, it's possible I wasn't the store's ideal customer. At dinner that night — our last in town — at Wolf in the Fog, we were in a celebratory end-of-shoot mood. How could we say no to an upscale punchbowl? When balanced just right, it turns out that Earl Grey tea, sherry, and brandy go together very nicely. Yes, this standout restaurant has won national awards for a reason. 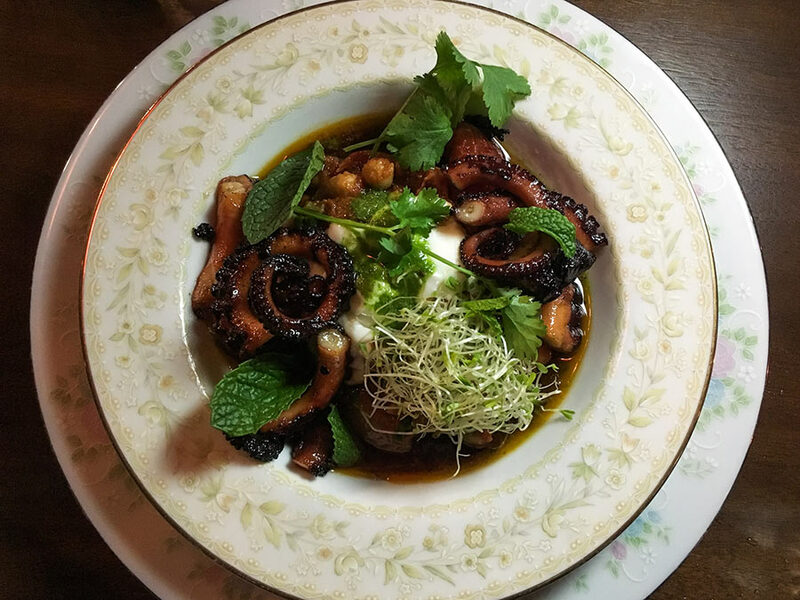 We paused our movie talk to heap praise on the first appetizer: tender octopus on a cream bed of mint and alfalfa sprouts, enlivened by Moroccan spices. I had pillow-soft scallops from Vancouver Island's Pelican Bay, in a Meyer lemon confit. All this went down in sexily Nordic mise-en-scène of slate-gray walls, black banquettes, and sculptural light fixtures. Joe Martin on the Rainforest Trail in Pacific Rim Park. Joe Martin in Pacific Rim National Park Reserve, in Tofino. He makes his canoes out of big red cedar trees like this one. There were beautiful wooden ceiling beams too, which brought me back to a moment earlier in the trip, when we'd filmed Joe walking along Pacific Rim Park's Rainforest Trail. He'd led us to a giant, several-hundred-year-old red cedar, the kind of tree that would provide him with enough wood for several dugout canoes. Cutting one down — for him, at least — was no small process. He would examine not only the tree itself, but also the surroundings, for a sense of the tree's qualities and of the damage it would cause when felled. He would have to get permission, assemble a team of helpers, and perform the time-honored rituals associated with sacrificing a tree of such age and stature to his needs. All this is something to think about, I reflected, the next time I paddle a canoe, which will almost certainly not be one made with this amount of respect for nature. Joe Martin — his world, craft, the way he approaches both — are things a surfer might think about, too, the next time he or she is on the waves. Especially if those waves are in Tofino. Darrell is a freelance writer based in New York City. His articles have appeared in The Wall Street Journal, Departures, Afar, Travel + Leisure, and other outlets. He is co-founder of the website Jungles in Paris. He travels for mental stimulation and for a change of air.